Klee, 1879-1940, one of Switzerland’s famous artists in art history studied closely famous paintings by van Gogh, Cezanne and Henry Matisse. He wanted to assimilate everything and not miss something of importance. In 1911 Klee became a member of the Blue Riders, a group of German Expressionists, and exhibited his art in their second show. 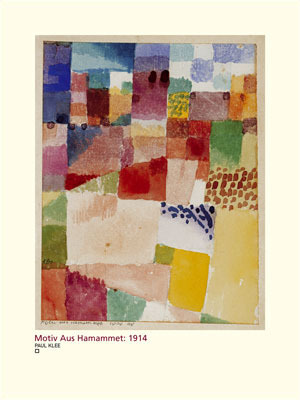 Paul Klee used many different materials, mediums and grounds in many of his paintings. He built up the ground of various paintings with paper to affect the texture of his artwork. This is different from the Cubists Picasso and Braque in that their build-up of forms and textures was the main focus of their collages whereas with Paul Klee it was a technique. His art materials included oil, watercolor, cardboard, burlap, chalk, plaster and encaustic, a method in which colors in wax are fused to a surface with hot irons. An example is another of Klee’s famous paintings”Oriental Garden”, 1937. The composition is chalk on cotton, chalk applied to a wet cotton ground and absorbed by it. Klee was an experimenter. He painted on glass reminiscent of a Bavarian folk tradition. He innovated a technique by coating a pane of glass with tar and then scratching lines on it. Paul Klee described himself as “Abstract with Memories… seeing not only consists of immediate optical sensations, but also involves associations of feelings, things and events that have long since filtered, unnamed into our imagination”. In the “Creative Credo”, 1920, Klee saw artwork, beyond its individual meanings, as a process of creation. “A certain fire, an impulse to create, is kindled, is transmitted through the hand, leaps to the canvas, and in the form of a spark leaps back to its starting place, completing the circle----back to the eye and further (back to the source of the movement, the will, the idea”. Giving further definition how Paul Klee created some of his visual iconography he said, “The formal elements of graphic art are dot, line, plane and space”. Expanding this idea “Let us take a little trip into the land of deeper insight following a topographic plan. The dead center being the point, our first dynamic act will be the line. After a short time, we shall stop to catch our breath (the broken line, or the line articulated by several stops). I look back to how far we have come (counter movement). Ponder the distance so far traveled (sheaf of lines). A river may obstruct our progress: we use a boat (wavy line). Further on there might be a bridge (series of curves). One can now visualize how Paul Klee creates some of his artwork taking a close look at one of his paintings in art history, “Harvest of Lemons”. Many times Klee will attach a long title to his paintings to help explain the meaning of his artwork. At the Bauhaus Klee had a large art studio and at one time worked on as many as twelve paintings at one time. If he had a new idea he would start another painting. If he ran into a temporary problem he would work on another painting realizing the problem would eventually become clear. Other famous artists of Klee’s time are Vassily Kandinsky and Robert Delaunay.